The study was conducted to determine the effectiveness of video in comparison with selected instructional media for teaching primary school pupils Agriculture and Environmental Sciences. It examined also the effect of gender and grade on the performance of the pupils taught with four instructional media. 240 pupils from 3 rural primary schools in Badagry Local government Area of Lagos State, Nigeria, were taught three topics drawn from Agriculture and Environmental sciences. The non-randomized quasi-pretest posttest experimental design was used in finding out which of the pupils in the four experimental groups – video, realia, charts and No instructional media performed best. The study revealed that the pupils taught with the video performed equally as well as those taught with real objects (Realia). While both groups performed significantly better than those taught with chart and without instructional medium. There was no significant difference in performance based on the gender. With regards to grade (Primary 5 and 6), only the group taught without instructional medium had a significant difference. The pupils in Primary 6 did better than those in Primary 5. The study concludes that video is as effective as the traditional teacher in teaching Primary school children Agriculture and Environmental issues. This confirms the assertion of many researchers of the potential of using video as an instructional medium in teaching varying subjects to adults, youths and children in the formal school system. The advantages far outweigh the disadvantages. The four methods that can be used by the teacher were recommended. An organisational structure in each state and video equipment needed for effective take off of the video programme in Primary schools in Nigeria were suggested. Keywords: Video, Instructional Medium; Teaching, Children; Agricultural science and Environmental science. Video is a potential window that can expose the minds and heart of many rural African children to modern Agricultural practices and Environmental concepts, far more than the traditional classroom teacher can achieve. Children and youths are so enthralled with home video films that they are described as video crazy (Akpabio, 2004). Their interest in watching home video films can be exploited in the formal school system in teaching Agricultural and Environmental practices in vivid and entertaining manner. Enlightened and middle class parents would want to encourage their wards to migrate to the cities, to escape the poverty circle in the rural community in order to make quick money. This fuels the loss of agro-labour force. There are fewer young farmers and increasingly older farmers in the rural community. Agriculture is becoming less attractive to youths. Modern agricultural practices presented to children in an exciting manner through video could reverse this attitudinal tendency of the rural people on the long run. In addition, conservation of soil and forest resources in the environment is not a priority concern for resource-poor farmers. Rural people are less bordered about Ozone layer depletion, desertification and depletion of forest resources due to "cut and burn" farm practices. Their main concern is on economic empowerment and improvement of the social infrastructure such as good primary health care and roads. A vivid motion picture through video of the long-term effect of their present bad practices could touch the soul of the children to convince their parents to adopt better farm practices that will sustain the resources for the incoming generation. Besides, the children and youths are likely to deviate from their parents' bad practices and take to environmentally sustainable/friendly behaviour. There is a strong need for an alternative technique of teaching the children if the Millennium Development Goal of better environment and education for all in 2015 will be attained. In addition, the sustainability of the agricultural labour force, rural – urban migration, food insecurity and massive youth unemployment are worrisome issues that evoke serious concerns and calls for urgent action to empower the youths early through educative, informative and entertaining agricultural/environmental video programmes. It is expected to improve on the current level of adult literacy put at 57 percent, incidence of poverty at 54.4 percent and life expectancy at 54 percent (CBN 2004). The primary school age (6 – 11) of children in Nigeria is 15 - 17 percent of the 140 million citizens of Nigeria. There is a 2.5 percent annual growth rate, 3 percent of GDP (US$493.2) budget on education, 62 percent net primary school enrolment/attendance and a teacher – pupil ratio of 1:85 in public primary schools and 1:35 in private schools. The National Policy on Education specifies that the curriculum of the Primary School (Basic 2– 6) shall include among others agriculture. The curriculum objectives are to arouse and sustain pupil's interest in the art of farming, enable them acquire elementary knowledge and manipulative skills in agriculture. It is also to prepare them for further studies and career opportunities in Agriculture and to appreciate the environment in a scientific way. Consequently, topics on the environment and farming were organized into units spread over the 6-year primary school period. It is stipulated that "a special attribute of the primary Agriculture core curriculum is its practical orientation right from the first year of school till it peaks at 100 percent practical work in year five, leaving year six for field work. (NERDC 1991). This is a beautiful document. But most primary school teachers are not even aware of it, neither has it been put into practice. This is the bane of Nigeria-good policy, poor execution. These objectives may never be achieved due to poor governance in Nigeria and gross ineptitude among educational administrators. The Universal Basic Education programme received a boost with an interest free loan facility of US$105 million from the World Bank disbursed to twenty states and Federal Capital Territory. In addition, Educational Trust Fund (ETF) disbursed $27.9million to state primary school boards for construction of new classroom blocks. (CBN, 2004). These funds are largely misappropriated. Primary school teachers are not well motivated. Poor salaries that come 3 – 6 months late are a regular occurrence. There are inadequate instructional materials, charts, models, realia, specimen and equipment. Dilapidating structures with leaking roofs, hot uncomfortable classroom with children sitting on the floor is observed in some cases. Teachers are poorly trained. They lack zeal and commitment. They are uninspiring, unimaginative and do just the much to earn their poor wages. The teachers face great challenges. They teach large classes (50 –100 students), use inadequate instructional media in a poor environment and inferior classroom condition. There is excessive paper work. Parents' indifference is negatively impacting on the teacher's efficiency. These challenges hinder effective teaching (Awake, 2001). The teacher and the school environment make learning fun. But these are in short supply in most primary schools in Nigeria. The load can be taken off the chest of the teachers with the introduction of video in the primary school system. The children can be engaged having fun and learning at the same time. Video is a powerful tool for instruction in the classroom. By means of it children could learn about lands and people they can never visit and how they cope with their environment. Children 'travel' to mega cities with skyscrapers and polar ice caps, to mountain peaks and ocean depths. It enables the children to peer into the intriguing worlds of both atom and stars. One watches documentary of what has happened on the other side of the globe. Video enhances comprehension and retention. Real life activities – illustration, demonstration and specimens in agriculture and the environment are brought to the pupils in the classroom in a neat and exciting package. Learning experiences that would have cost much (in terms of field trips) could be recorded with a video camera and shown on a television through VHS or VCD at much less cost. Environment issues such as effect of erosion, bush burning, pesticides poisoning, HIV/AIDS, forest degradation, global warming and climatic changes could be taught through video. The beauty of video is that it can be watched repeatedly as often as it is required. (Spencer, 1991; Ahmad, 1990; Adedoyin and Torimiro, 1999). Many studies have found no statistical difference in learning due to the presentation medium, whether it is face-to-face in a classroom teaching-learning process or face-to-screen in a distance education setting. What makes a course good or poor is a consequence of how well it is designed, delivered, and conducted. Dannenberg and Capell (1997) conducted a study on the effectiveness of Just-In-Time Lecture technology via video as a delivery mechanism. They found no significant difference in the achievement of students taught in the classroom and those taught through video. The students that received instruction through video complained of not been able to ask questions immediately. The delayed feedback-feed forward mechanism in distance learning through video or any other electronic medium is a major drawback. In the study, reference was made to a three-year study involving 200,000 students and 800 public schools. One hundred and nineteen were significant in favour of television –taught students and 44 in favour of the teacher-taught students. Most of the comparisons showed no significant difference. Another study on the comparison in achievement in seven different courses between students taught with closed circuit television and conventional manner showed no significant difference in 29 out of 32 cases. Classroom instruction is the optimum delivery method. Distance Education can be as effective as classroom instruction. Absence of face-to-face is not in itself detrimental to the learning process. What makes a course good or poor is a consequence of how well it is designed, delivered and conducted, not whether it is face-to-face or face-to-screen. From the fore-going, many researchers have attested to the effectiveness and advantages of using video as a medium of instruction. It is low cost. Returns on investment are attractive. Its flexibility, convenience and availability are quite good. Students generally are favourably disposed to it. Group discussion which aids social skills among students is enhanced. ( Isiaka, 2000; Dopemu, 1990; Ahmed, 1990; Talabi, 1989). The study focused on the effectiveness of video in comparison with chart and live specimen (realia). The effectiveness was determined by the performance of pupils taught certain subject matter. The relationship between gender and class on the performance of pupils was established. The achievement test used to determine the performance of the pupils consists of 30 multiple choice questions with 4 options on the three topics – construction of vegetable bed, simple farm tools and soil conservation. The topics were taken from the primary school Agriculture curriculum. The video clip on the three topics were produced locally and edited for its suitability for teaching children. The socio-cultural and psycho-cognitive status of the children was put into consideration in producing the video. The video group was taught with the video alone without the intervention of the teacher. The realia group was taught by the teacher with the real objects and demonstration of the practice. The teacher taught the chart group with charts containing diagrams, drawing and pictures of the concept taught. The no instructional media group was taught using lecture method without any instructional material. An interval of three hours was given between pretest and posttest. Analysis of variance was used in comparing the performance of all four groups. T test statistical analysis was used to compare the performance of male and female; primary five and six pupils. Scores of each pupil before instruction and after instruction were computed. Difference between pre and posttest (the net gain) was calculated. The percentage means net gain for each experimental groups male and females, and primary five and six were computed separately. The ages of the pupils range from 10 and 16 years with mean age at 14.75 years. Ideally the ages of the pupils of primary five and six should be between 10 and 11 years with mean at 10.5 years (FRN, 2004). Pupils in rural areas start primary school later than their urban counterparts. Thus older pupils are found in rural schools. The mean net gain score, which is the difference between the pretest and the posttest, was computed for the four treatment groups. The video group is slightly higher than the Realia group (56.75 and 56 % respectively). The chart group scored 44 percent while the No instructional media group scored 36.75 percent. This result in table 1 confirms the assertion of Isiaka (2000), Dopemu (1990), Ahmad (1990) and Talabi (1989) that video can be effective in teaching both adult and children varying subject matter. Since the information in the video clip is as real as life, it is not surprising that the performance of the video group is slightly higher than the Realia group. The chart group had 44 percent, coming 3rd while the No instructional media group had 36.75 percent in 4th position. It is noted that in all the groups, the posttest score was relatively high with the least score of 62.45 percent by the No instructional media group. Table 2 shows that the F cal of 19.4 is greater than the F tab of 2.76 at alpha 0.05. This implies that there is a significant difference amongst the four mean net gain scores of the pupils taught with varying instructional media. The result in table 3 shows that video, Realia and the chart groups performed significantly better than the no instructional media group. The Realia and the video groups did significantly better than the chart group while the video group performed equally well as the Realia group. The conclusion from the study is that video as an instructional media is as effective as the realia in the teaching-learning process in primary schools. The use of realia, video and charts is more effective in teaching the subject matter than not using any instructional material. The inadequacy with lecture method particularly for primary school children has been brought to the fore (Orukotan and Oladipo 1994; and Oke and Oshodi, 2000). It is expedient for the primary school teacher to make use of instructional media in passing information to the pupils. Asoga-Alliu (2002) confirmed that the use of realia (real object/practices) in teaching is most effective. A strong case can be argued for the use of video since it presents scenes, activities, demonstration and objects of the subject matter as real life. Bamidele (1996) and Benedict (1995) both confirmed this fact from the study conducted using video to teach secondary school students. There was no significant difference in performance between male and female pupils within each treatment groups as shown in table 4. Similarly, no significant difference in performance was found between primary 5 and primary 6 pupils within video, Realia and chart groups except the group taught without instructional media. The pupils in primary 6 performed better than those in primary 5. This implies that gender difference does not affect the performance of the pupils no matter the method used in teaching (Amoo, 1990) but class difference does, particularly where no instructional media is used in teaching the pupils. (Haruna, et al 1998 and Isiaka and Dacosta, 2001). tcalc = Calculated t value. Based on the findings of this study, it is concluded that the use of video (in the absence of the teacher) in teaching primary school pupils is as effective as when the teacher uses the real objects in teaching Agricultural and Environmental Sciences. The use of video is more effective than the use of charts and when no instructional media is used. In view of the challenges primary school teachers are facing in Nigeria and the weak political will of the Government to address the worrisome issues, it is suggested that the Parent Teachers Association in each school should go into partnership with the Primary School Management Board,the state agency that oversees the running of primary schools in each state and procure necessary funds to put the video infrastructure in place. The structure includes both institutional organizations and video equipment. The video equipment recommended is a television and video player/recorder and locally produced video CD on Agricultural and Environmental issues to be located in each school. Documentaries on Agriculture and Environment could be dubbed from local television broadcast and satellite stations (Adewoyin 1998). 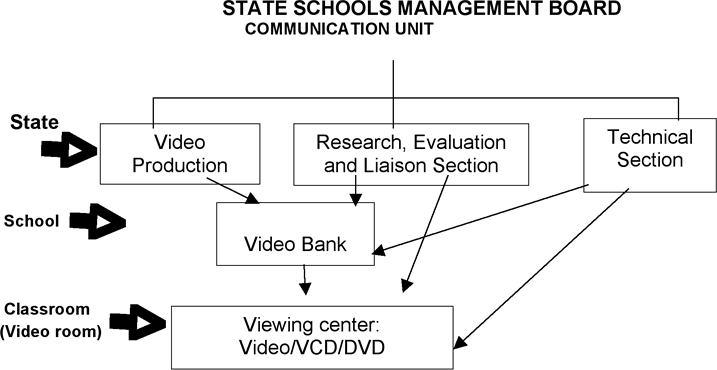 The Primary School Management Board should establish a unit, which could be called VIDEO RESOURCE CENTRE with the organizational structure shown in Figure 1. There should be a communication unit in each of the states' Primary School Management Board. The unit should consist of three sections: video production section, research, evaluation and liaison section and technical section. The video production section should be responsible for the production of instructional packages in agriculture and environment specifically for primary school children. Relevant video clips from various sources are procured and edited to make them suitable for the children. The video clips are multiplied and distributed to the schools. The research evaluation and liaison section should be mainly involved in conducting research on various issues on the effect, response on the video instruction and comments of the teachers, pupils, parents and the production team. Linkage is established with stakeholders in the educational system- Non-governmental organizations, teachers, parents, and so on. The technical unit is involved with the repairs and servicing of all video apparatus in all the viewing centers. Selected people, teachers and pupils are trained in operating the video equipment and to handle minor repairs and routine maintenance. Personnel in this section, also deal with the preservation and handling of the video clips of each school's video bank. At the school, a technician maintains the video bank, which contains relevant video clips. The clips are classified; labeled and stored in a conducive, dust free and dry room. The technicians locate the video clip needed and issue them to the teachers for use in the classroom or video room. A classroom teacher who learns the language along with the students, uses the video-based program as the foreign language curriculum. The video-based program is used as the foreign language curriculum by a classroom teacher and is reinforced on a weekly basis by a foreign language teacher or aid that speaks the language. The video-based program is used by a language teacher as a supplement to the foreign language curriculum. The video-based program is used by a language teacher as the foreign language curriculum. The adoption of any of these four methods is dependent on the technical competence of the teachers in Agriculture and Environmental Sciences. With low level of motivation, huge paper work, low competence of primary school teachers in Agriculture and inadequate number of teachers to teach the subject matter the first option is readily feasible in primary school system in Nigeria. The teachers will be as excited as the pupils in learning side-by-side via the video programs. Adedoyin S.F and Torimiro, D.O. (1999): A manual of children-in-Agriculture programme in Nigeria, Ago-Iwoye, Communication, Extension and Publication component, CIAP National Headquarter. Adewoyin, J.A. (1998): A practical Handbook on Educational Technology, Lagos, Raytel Communications (Nig.) Ltd.
Ahmed, N. (1990): The use of Video Technology in Education, Educational media International 27 (2) 119-123. Amoo, B.O. (1999): Educational Technology Handbook: Classroom Application. Ibadan, Rex Carles Publication. Asoga-Allen, K. (2002): The Teaching Profession: A pragmatic Approach, Ijebu-Ode Fembol Integra Nig. Ltd. Awake (2002) Teachers: Why do we need them, March 8, 2002, pp. 3-13. Bamidele, B.O. (1996) Instructional media, Benin, Idohen Printers. Benedict, N. (1995): Essentials of Educational Technology, Ijebu-Ode, City Publishers. Central bank of Nigeria (2004): Annual Report and Statement of Account Abuja, CBN. Dannenbreg, R.B. and Capell, P. (1997): Are Just-In-Time Lectures Effective At Teaching? http://www.jitl.cs.cmu.edu//effectiv.pdf. Dopemu, Y.A (1990): The effect of colour on Students cognitive Achievement in Video Instructional; Educational Media International 27 (12) 64-69. Federal Republic of Nigeria FRN (2004): National Policy on Education, Lagos. NERDC Press. Haruna,I.Okeh, B.I. and Ajayi, S.I. (1998): The need for a functional curriculum preparing teachers of Agriculture in Nigerian Education System. Nigerian Journal of Agricultural Education 1(1) 11-15. Isiaka B.T. (2000): Assessment of Video Tape Recordings as an Instructional Media in Teaching Agricultural Science in Lagos State. Public Secondary Schools, Unpublished M. Agric. Thesis, University of Agriculture, Abeokuta, Nigeria. Isiaka B.T and Dacosta, F.A. (2001): Vocational and Technical Education methods Lagos, Alogrifics Communication Ltd.
Kumar, A. Sharm, R.C. and Vyas, R.V. (2003): Impact of Electronic Media in Distance Education: A case of Academic Learners' perception. Turkish On-line Journal, http://tojde.anadolu.edu.tr/trojde12/articles/vyas.htm. Moore, M and Kearsly, G. (1996). Distance Education: A systems View. Belmont, Wardsworth Publishing Company. Nigerian Educational Research and Development Council (1991): National Core curriculum for Primary Agriculture, Lagos, NERDC, Press. Oke, C.O and Oshodi, M.O. (2202): The teaching profession, Lagos, Nitox – Kuncho Publishers. Orukotan, A.F and Oladipo, S.A (1994): Primary Education in Nigeria, Ibadan, Olu-Akin Publishers. Spencer, K. (1991): Modes, Media and Methods. The Search for Educational Effectiveness, British Journal of Educational Technology 22(1) 12-22. Talabi, J.K (1989): The Television – Viewing Behaviour of families in Kwara State, Nigeria. British Journal of Educational Technology 20(2) 135-139.